Sure, people will come to your restaurant for the food, ambiance and impeccable service, but they need to find you first. Word-of-mouth, newspaper, and social media marketing tactics all work at increasing brand awareness for your business, but SEO spreads your branding farther and more sustainably than anything else. It’s a marathon approach, however, so it requires a plan and a committed effort to reap any rewards. 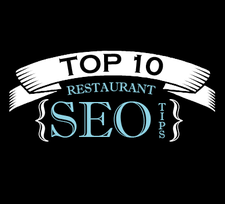 That said, here’s our Top 10 Restaurant SEO Tips taken directly from our internal cookbook that are as sure to fill your tables faster than a good ol’ blue-plate-special. While this isn’t the Joy of Cooking equivalent to DIY SEO tips, it covers the basics that most restaurants and businesses struggle with. 1. Keyword Research: Think for a minute how you search for things online. You type words into a search bar, hit the enter key, and in half-a-second are presented ten options, maybe a map, and a few paid adverts to pick from. Things work the same for voice-search like on Google Now and Siri. To have any sustainable visibility on search engines – you need to be using the right key-words throughout your website and internet assets (like Facebook, images, articles, press releases, and business listings). Keyword research will discover the right words that will increase the visibility and discoverability of your restaurant. Keywords are the centerpiece for all internet marketing. If the administrative part of your website allows for “META Keywords” don’t use it, these aren’t used any longer by any search engine. You’re just going to give your strategy away to SEO pros if you do… Trust me on that. If you blog however, do use Categories and Tags as you would META Keywords. 3. NAP: By our observations, 80 percent of businesses have errors in at least one element of their business name, address, and/or phone number (aka: N A P or citation data). I’ve written about thisbefore, so no need to detail it again – suffice to say that getting this dead-on-accurate is paramount for local search engine visibility. [See link/citation building below] In addition to this NAP, make sure your hours are prominently visible on your website. Adding this stuff in the footer of your website will make sure your complete contact information and hours of business are listed on every page. Search engines feast on those morsels of NAP info and can reward your business with greater visibility for optimizing it. 4. Schema: This bit of code is useful for identifying things like your NAP, opening hours, payments accepted and other information to search engines in their own language (code). Accepted by all search engines, this advanced tidbit is a must have for restaurants reliant on local marketing and/or being discovered in mobile searches. Which is all of them. 5. Map: Make sure you have a Google map on your contact or locations page but not just anyGoogle map – the map connected to your verified Google Plus (G+) profile page. Which, of course, means you need to have a verified and optimized G+ page. So once you’ve got that, look at the bottom of your new map page and click the gear icon in the lower right, then click “Share and embed map” when the menu pops up to get the code and paste it onto your website. Easy. You’ll now see your business name on the map instead of just your street address, and very little else (like your competition). Google can now draw a strong correlation between your G+ map location, the information on your G+ profile and your actual business. 7. Link/Citation Building: Complete and optimized profiles on tripadvisor, yelp, and menuism are staples for restaurants. These listings should be as complete as possible, and the narrative spiced up with the keywords vetted from your research. Images used here should also have their filenames optimized with these keywords in addition to your restaurant name. Don’t forget to add your menu to your listings as either a link or .pdf file. Other than website optimization, building profiles on highly authoritative directories (like those mentioned) with accurate NAP/citation data is the second most important element for getting listed on search engines and discovered by people searching for you. Link/Citation building helps people discover your restaurant on their PC as well as on a mobile device (phone/tablet). 8. Content: It’s an overused cliché, but content really is king. Make sure your content is well written, contains the high priority keywords from your keyword research and tells a story to your readers. Websites stopped being online brochures a long time ago – so make sure the tone of your site doesn’t sound like one. And don’t forget to link out from your website pages to the other pages of your website as well as to the other internet assets you use to market your business, like Facebook and Pinterest. 9. Social Media: Given all the hype social media gets – I’ve got bad news for you – social media isn’t likely to drive as much traffic to your restaurant as you hope it will. Statistically, social media will deliver a 5% revenue ROI whereas SEO drives 51%. Other marketing mediums like word-or-mouth and print drive the remaining 44%. But what social media has going for it is the ability to convey a story and post an image and have those shared by your raving fans better than any other medium or channel. So make social media work for you by using compelling writing, inspiring images, and be sure to start your post with your primary keyword as close to the opening sentence as possible and have a link back to your website. When linking back to your site, target the most relevant page of your site not just the homepage. And if you use #hashtags, tag your keyword and your city or town. I advise my clients to use the 80-20 rule when using social media (or blogging). 80% of their posts should point to a keyword on their primary keyword list. Just remember this rule – 80% of your non-website internet marketing actions should drive traffic to your website and target a keyword. It’s not rocket science – you can do it. 10. Reviews: Online reviews not only are great selling points for your business, but search engines could reward you for being such an awesome business by bumping you up in rankings for your ability to please your customers. So make sure you have a page on your website for “Reviews” and post your best ones there. Word of caution here, Google doesn’t want you to copy and paste their reviews on your website or anywhere else on the internet – so the best case for Google reviews would be to share them in a non-text format, like in an image or video. What we have done on our sitewas to create Pinterest pins of our reviews and add those to our website as a slideshow. It’s a different approach that is sure not to receive any warnings from Google or any other search engine should they establish the same policy. Bonus! Whereas social media typically stays within its channel (Facebook messages stay on Facebook, Twitter on Twitter) blogging spreads throughout the internet. We strongly recommend our clients blog first – then share these posts on their social media channels. This strategy gives them the exposure on search engines and within social media for the same amount of effort. Also consider using a syndication platform for managing this like Sendible (that’s who we use – look them up), this will make short work of managing it all whether you blog alone or as a team. And there you have it – we’ve dished out a ten-course spread of our top ways to drive traffic to your restaurant. So turn up the heat on the notion of getting your restaurant discovered online!